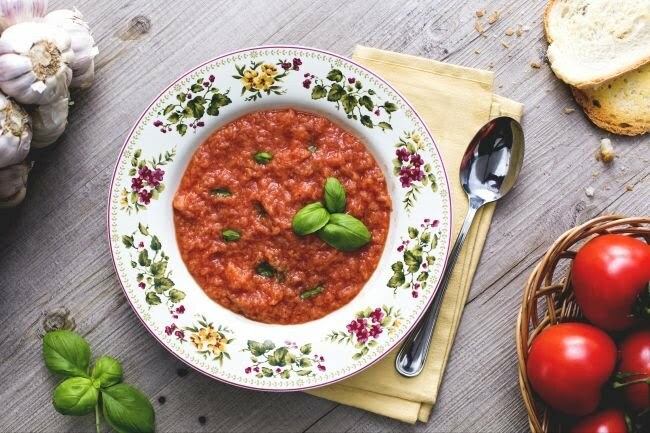 Sting and Trudie Styler's private chef, Joe Sponzo, grows tomatoes at Il Palagio for his take on the classic Tuscan pappa al pomodoro, a hearty tomato-bread soup. When they're ripe, Sponzo passes them through a food mill to make passato, a concentrated tomato puree he jars for year-round use. He buys his bread in Figline Valdarno, from a bakery that uses a wood-fired oven. "You want a dense, crusty bread, then let it get stale for two days," he says. Bring a large pot of water to a boil. Fill a large bowl with ice water. Cut a slit in the base of each tomato. Add the tomatoes to the boiling water and blanch just until the skins start to split, about 10 seconds. Transfer the blanched tomatoes to the ice water to cool. Peel and halve the tomatoes crosswise. Working over a mesh strainer set over a large bowl, pry out the seeds and press the tomato juice and pulp through the strainer. Discard the seeds. Coarsely chop the tomatoes. Wipe out the pot and heat the 1/2 cup of olive oil. Add the onion and cook over moderate heat, stirring, until softened, about 6 minutes. Add the garlic and cook for 1 minute. Add the tomatoes and crushed red pepper and season with salt. Cover partially and simmer over moderately high heat until the tomatoes have cooked down, about 30 minutes. Add the bread and the reserved tomato juices to the soup and cook, mashing the bread until fully incorporated, and season with salt. Stir in the basil leaves. Spoon the soup into shallow bowls, drizzle lightly with olive oil, top with a dollop of ricotta and serve right away. The soup can be prepared through Step 3 and refrigerated overnight. Reheat before proceeding. This traditional Tuscan soup is robust enough for red wine, but its summery flavors taste particularly good with rosato (rosé), especially ones made from Sangiovese; the wine's cherry-berry fruit seems to intensify the already sweet flavors of end-of-season tomatoes.